2018, July 6th: 2018, July 06 - H.H. The Aga Khan, our Mowla Mushkil-Khusha, Ahl-e-Nabi, Aulad-e-Ali, has arrived in Lisbon, Portugal this afternoon and was welcomed by thousands of Ismaili Murids, his "Beloved Spiriual Children". MUBARAK! MUBARAK! 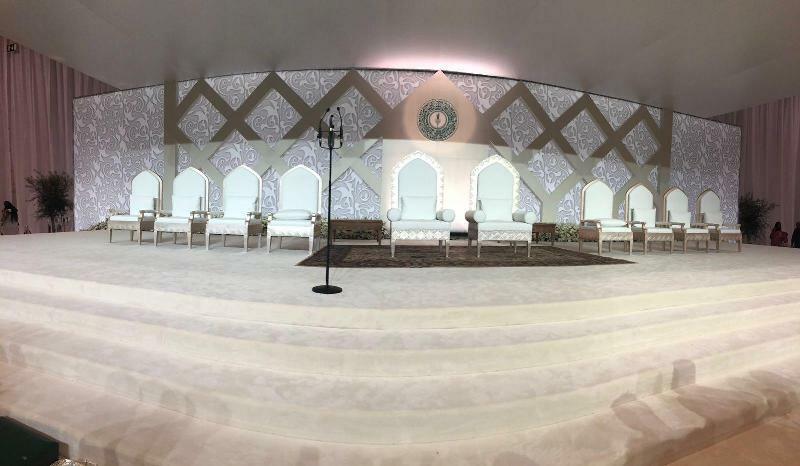 Mawlana Hazar Imam graced the Portugal jurisdiction Jamat with a Mulaqat at Centro de Congressos in Lisbon on 7 July 2018. Hazar Imam also met with the Jamat at the Ismaili Centre Lisbon earlier in the day. The upcoming Darbar with the global Jamat on 11 July will mark the completion of Hazar Imam's Diamond Jubilee year during which he has granted Darbars and Mulaqats around the world. 2018-July 7th: Mowlana Hazar Imam performed various religious ceremonies for his Jamat under the jurisdiction of the P0rtugal Council. 2018, July 7th - H.H. 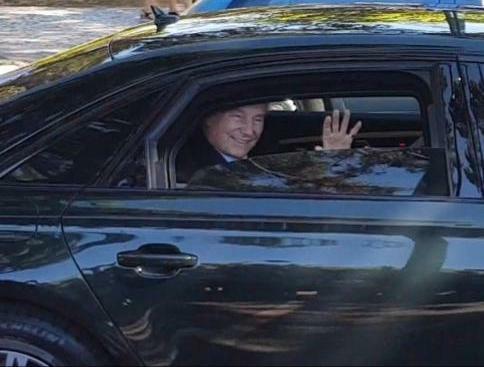 The Aga Khan coming out of Centro de Congressos de Lisboa and waving to the crowd outside. Look how happy the Imam is. • Please note that mobile phones, smartphones, smartwatches as well as electronic devices capable of recording audio or video including tablets, personal computers, as well as any devices capable of broadcasting or receiving data, will not be permitted in the Darbar Hall. Secure lockers are available to store these items during the Darbar. The lockers are located between FIL 1 and FIL 2. The cost is 20€ per locker. • During the visit, should you require medical assistance, our First Aid teams can be identified by bright red shirts. • Quiet Rooms and a designated Special Needs area will be on site which are special stations hosted by professionals skilled in stress management, de-escalation, and working with individuals with Special Needs. There will be mental health professionals available to help support murids experiencing mental health crises. • Families with Jamati members who are deaf and require American Sign Language interpretation should identify themselves to the volunteers upon arrival, to be guided to the respective seating area. Ya Ali Madad Does anyone know if Nyaz and Juro will be distributed in Lisbon tomorrow. Thank You. He is one of the wealthiest men in the world and is about to live in Portugal. He has a life of commitment to the community, which follows him as Imam, and has never failed to analyse the world for the benefit of his followers. In his eyes, religion is for a premise of peace, but also of wellbeing, knowledge and economic development. A week ago he celebrated in our country’s capital his Diamond Jubilee, 60 years as leader of the community, which he considers to be his great source of happiness. He has elected education, healthcare and economic development as his main points of action and has taken his congregational power across the world. He brought almost 50 thousand people to Lisbon, with whom he celebrated the commemorations. Before, on a sunny morning, he spoke with Expresso about the beginning of his mandate and the present times, about religion and politics, about the community and himself, in a singular refuge where, with the warmth that has always characterised him, he let us talk, carried by a warm breeze. It was a long, dense conversation, with an intelligent man who is both a leader of the spirit and the mind, a thinker and a true master of the 21st century. Alexandra Carita: You were very young when you received the title of Imam of the Ismaili people. What concerns did you have at the time and what concerns do you have now? His Highness the Aga Khan: Well, to go back to that moment, we have to put ourselves in what was a very stressful time, globally. There were two things happening at the same time, simultaneously. One was decolonisation and the other was the Cold War. These two phenomena were happening more or less at the same time, so there was an overlapping agitation. Much of that world was and is where my community lives and used to live. It was a transitional situation between colonial status and freedom, but freedom within the Cold War. So that was an extremely sensitive time to try and make sure that the Ismaili community maintained the right values, in a time of transformation. That those were the values of independence movements, because we wanted our community to be seen as a community of citizens of these countries, and therefore able to participate in public life, including political life. AC: What kind of work did all this entail? It was a time of observance, a time to talk to as many people as possible, to understand what their goals were within the national situation they were in. AK: Careful planning done in a time that required us to analyse the trends and the paths that would be taken and to know where they, the members of this community, would stay, or if they would be, as they say in French, passager [travellers]. Would they leave and not stay in their countries of origin? It was a time of observance, a time to talk to as many people as possible, to understand what their goals were within the national situation they were in. I went through those times, especially the sixties, without thinking of another major trauma. There were countries that opted for what I would call the Eastern Block, and there were countries that maintained their independence vis-à-vis global international politics and wanted to have and create their own direction, and we adapted ourselves to these situations according to what it was possible to achieve. And we were fortunate. We were well accepted as a community that has its own institutions. We chose to continue to build these institutions in the areas of education, medicine and healthcare, in economic development. There was a time when the most complicated colonial situations were many, especially in the British colonies, where the community was encouraged to maintain its own institutions. After the independence, the movement of these institutions was to meet nationalisms instead of meeting the community. As a result, many of our institutions went beyond the context of the community and drew closer to the national context. And that is where we are today. AC: What does this Diamond Jubilee mean to you? AK: This is an important occasion. We set goals that we want to achieve and a number of things that we would like to see grow, especially in countries like Tajikistan, which only recently became part of our area of action. We are working in countries where, in fact, we do not have the structures we already have in other parts of the world. For example, we have much stronger structures in East Africa because we have been working there for a long time. We still have to create the same structures in Tajikistan or Kyrgyzstan or other countries in that area. Therefore, we will have to build these institutions. I think what we are going to do is try to invest in actions that help us build the future. Building the future is important. And we do it through strong and solid institutions in the fields of education, healthcare and economic development. And they are not institutions for the community, I repeat. They are institutions that operate at an international level. Maybe they started as community institutions but they grew from there. We have always tried to grow in this sense or at least at the regional level. For example, we are dealing with higher education at a regional level, not on a national basis. AC: One of your main concerns has always been education. Why is it so important to you? I firmly believe in a public-private relationship in what concerns this matter…. And I believe that this is the way we should go. I do not think that the State can or should be everything for everyone continuously…. Therefore, if we want society to be involved and to be developed, we must mobilise the private sector, not just the public sector. You know, where there has been an effort to mobilise only the public sector — and I think many of us would say the same, it is evident — that mobilisation has failed. AK: I believe that many of these countries need to create and increase all levels of education, so that it becomes a national and not just a local asset or resource. And I firmly believe in a public-private relationship in what concerns this matter. Many of the countries that you know, that I know, which are now industrialised and highly successful countries, have a pluralism in the fields of health and education. And I believe that this is the way we should go. I do not think that the State can or should be everything for everyone continuously. I think the private sector has to, let’s say, be engaged, committed. There are fields where the private sector commands, leads, so often in research, for example. This is more a domain of the private sector than of the public sector in the countries where we have been working for years. Therefore, if we want society to be involved and to be developed, we must mobilise the private sector, not just the public sector. You know, where there has been an effort to mobilise only the public sector — and I think many of us would say the same, it is evident — that mobilisation has failed. At least this is my point of view from the experience that I have had. And, I think the two sectors can coexist, they do not have to be enemies. In fact, it is much better when they coexist. AC: Coming back to the Diamond Jubilee. How would you like this year to be remembered by the Ismaili community and by the world? I see the Diamond Jubilee as an opportunity to accelerate social and economic change. And this is what I would like to try to do and to achieve together with the leaders of the Ismaili community, but obviously they have to be in the lead, in the thinking and reflection about these matters. Well, I think it is one of those cases where we have a deadline to work towards and to complete certain initiatives, and a time when we would like to start others. For this very reason, I see the Diamond Jubilee as an opportunity to accelerate social and economic change. And this is what I would like to try to do and to achieve together with the leaders of the Ismaili community, but obviously they have to be in the lead, in the thinking and reflection about these matters. AC: I know this is not an easy question, but I wanted you to explain to me the role of religion in today’s world. I will begin by saying to you, that all civilised societies need to have an ethical framework. Otherwise, civil society cannot function in a serious and planned way. If civil society wants to be a major force at the national level, this is how I see the developed world accepting it. And so, civil society needs to be anchored in a set of ethical premises. I think these ethical premises are often anchored in faith, in religion. So I think this is the relationship I would establish and which I consider to be very, very important. However, with regard to this issue, we are obviously interested in countries that have pluralist attitudes towards faith, in relation to society, etc. And Portugal has them. We are very, very honoured and grateful to have been able to establish our religious institutions in Portugal, which, in fact, have a global goal, because this is what Portuguese law allows and encourages. In addition, we will continue to use Portuguese civil society to be able to develop our institutions in the developed world. AC: Is the Imamat going to work in Portugal? We are trying to make globalisation in our institutions a reality so that we can serve the communities, wherever they may be. But it is a process. We never reach a full result. That is not realistic. AK: This does not mean that we do not work in other countries as well. We will. Particularly, because our community is a very pluralistic one. It is not based in a part of the world, nor in any language or anything of the sorts. We have to be as flexible as possible to meet needs wherever they require. And like any community that is global, we cannot handle all of these issues at the same time. We have to identify priorities; we have to try to respond to the needs that occur. But this is essentially anchored in institutional capacity, not in individual capacity. We are looking, for example, at the role of higher education. And where higher education does exist, is it satisfactory? Where is investment needed? Where is it necessary to think more broadly in geographical terminology, because often higher education is limited to a geographical area? We are trying to make globalisation in our institutions a reality so that we can serve the communities, wherever they may be. But it is a process. We never reach a full result. That is not realistic. AC: And as for the principles of the Ismaili religion. How do they align with other Islamic principles in general? And we have tried to be in what I can call, the field of high technology applied to each area to which we are dedicated. AK: I would say very well. We do not have issues of this nature. We are Shia Muslims and therefore the community has an Imam, whose appointment is hereditary. But broadly speaking, I think we are seen as an asset in most of the countries where we live. And we are encouraged to extend our institutions, to transform community institutions into national institutions. We have done this with our economic, educational and healthcare institutions. These institutions must have begun in the 1950s as community institutions, as I have mentioned. And if we think of the 1950s and 1960s, in the British colonies, for example, we will be reminded that communities were encouraged to create their own institutions. Today, this is completely forgotten, it does not exist. Nowadays, the goals are to create national institutions to serve everyone. This implied changing the dynamics and the scale of what we were doing. And that means repositioning institutions so that they have a logical position in the future of each country. And we have tried to be in what I can call, the field of high technology applied to each area to which we are dedicated. AC: Can you give us an example? AK: For example, in medicine, we are interested in tertiary care. We are not a public service organisation that can provide first aid throughout the country. That is not our role. That is why we focus on the tertiary service. Are there priorities in this field? Yes, there are priorities. Cardiology and Oncology. We are specialists in cardiology and oncology because we think this is the role of our healthcare institutions. And we are investing in research; we are investing in partnerships with institutions outside the Western world because we think they can bring us new insights. And in return, we provide them with the research they do not have. That is why they are very happy to work with us in our institutions; they can do the research that they are unable to do in their countries of origin. We are expanding our global relationships in the technical fields very solidly. Some of our financial institutions have grown and are now national. For example, I think Habib Bank may be considered the most important bank in Pakistan, today. The Jubilee Insurance Company is one of the top insurance companies in the country. Therefore, between 1957 and today, our institutions have become national or regional institutions, which is the right positioning. The idea that small communities can develop institutional capacities is frankly not realistic. AC: Is that the duty of religion? We are continually evaluating ourselves. And the goal is to have more practice, more ability to perform. It is to take to each community, each country, each region, the best practise, in whatever we are doing. AK: I think it is much more than that. And it is not just religion. It is what national needs represent. If you have the capacity or the means to develop that capacity, I think it is the duty of a national institution to seize opportunities and develop them, if you have the resources to do so, the willingness to do so and the ability to do so. And we measure our performance against global standards in health, education, and the economy. We are continually evaluating ourselves. And the goal is to have more practice, more ability to perform. It is to take to each community, each country, each region, the best practise, in whatever we are doing. AK: I begin with the premise that society cannot develop itself if it does not live in peace. And I think peace is the premier premise for all of us. But either you are in a country where there are internal conflicts, or you are where there is a regional conflict. And that, in my opinion, is the end of development. Hence the number one premise is the consensus on national goals. What are the national goals? Are they consensual? Are they egalitarian and just? Do we have the right resources to make them work? I look at society as a set of capabilities that need to be developed together so that the sum is greater than the addition of small numbers. And I think we are beginning to see that. I go back to the fifties and sixties, when there was still what I call a colonial heritage. That form of approach to a national consensus was not very strong. Many of the colonies have been developed through the division of people rather than through their unity around a common goal. I think this no longer exists today. Do not forget that in those decades we had an extraordinary situation because the process of decolonisation happened simultaneously with the Cold War. And the Cold War was very, very aggressive. Movements of independence and national policies were seen not only in the light of national issues, but also in the face of the Cold War. That no longer exists. So between that time and today, a great source of tension has disappeared. This has changed the dynamics of the world. If we think about Africa’s situation then, it necessarily reflects the effects of that War. Regimes and political leaders had to choose between the West and the East. Today they do not have to do so. Today these movements are related to their own dynamics. I think today the notion of performance is probably the greatest driver of political thinking. Which regimes perform well and build their capacity to deal with populations and have them under control? It is very interesting to see how everything has changed. AC: I would like you to talk about Portugal now. AC: What will the Seat of the Imamat bring to Portugal? AK: You have to ask the Portuguese. I cannot answer that question! AC: I would also like to ask you what the Portuguese can expect, by having the Seat of the Ismaili Imamat in Lisbon? When problems arise, and they are not here, but they arise in other countries, it is when religious institutions and national goals are not compatible. That is when we have trouble. However, Portugal has been very smart to work with religious institutions. We are not the only religion with which the Government works. AK: Well … the context is between the relationship between religious institutions and modern governance. This is the real context. A context in which religious institutions are improved in what they do, that is, they need a safe environment to enable them to function. These institutions, such as humanitarian institutions, have taken on certain objectives and developed their civil society capacity. And it is very important that country laws allow religious institutions to thrive, as it is even in the national interest. And Portugal is the ideal country for this relationship and has been extremely considerate to me, as Imam. I think the country has been very intelligent, in what concerns the building of bridges so that religions work well and always with a result that is of national interest. When problems arise, and they are not here, but they arise in other countries, it is when religious institutions and national goals are not compatible. That is when we have trouble. However, Portugal has been very smart to work with religious institutions. We are not the only religion with which the Government works. There is a very, very strong national precedent for this relationship to work. As a religion, we are working in the domain that is already very well positioned for the two sides to work together and as it should be. We are very grateful and honoured for that. AC: Has the Portuguese Government awarded you many privileges? What the [Portuguese] Government did was look at this relationship between religion and governance. The Portuguese began doing this with the Concordat signed with the Vatican. This was the first domain with which they worked, and they worked very well. That is why the experience of the Concordat was the springboard for our relationship and it has been a very, very happy relationship. AK: I would not call them privileges. What the Government did was look at this relationship between religion and governance. The Portuguese began doing this with the Concordat signed with the Vatican. This was the first domain with which they worked, and they worked very well. That is why the experience of the Concordat was the springboard for our relationship and it has been a very, very happy relationship. We have benefited as a religion from this precedent called Concordat. The Concordat was a very important step in the formation of your country in political terms and was extended to us by the Government. Portugal is dealing with difficult problems in a very efficient way. The Portuguese are strong in their convictions, it is the general opinion when I talk to my friends and we compare what is happening in various parts of the world. Portugal has made very important choices in modern history, courageous decisions. It is therefore a country we all admire. AC: And are we not gaining anything, with the establishment of the Imamat here? AK: Ah yes! We are going to create several institutions here but with international objectives. But we will continue to deal with each other under a great basis of friendship. There will be aid as there will be for countries like Mozambique and for Portuguese-speaking countries. It will be a very supportive relationship. And I hope we can share the interests of Portugal, not only here but also abroad. We have a set of common interests. AC: And are you moving here? I’m still contemplating if I will move or not. You will see me more often, I am sure of that. AK: I do not know. But I know I will come much more often. I’m still contemplating if I will move or not. You will see me more often, I am sure of that. AC: Have you ever thought about what your life could have been if you had not been appointed Imam when you were 20 years old? AK: I would probably have been a mediocre academic! AC: Do you have time to enjoy life, to take care of your own businesses, or not? AK: The truth is that I represent an institution and this institution does not come and go. There, is where all my time and my happiness is, working within that institution. That is where my happiness comes from. I am very, very privileged because I was not the one who chose to be the 49th Imam. My grandfather made that choice in 1955 or so, and I was not aware of it. I think that every individual who has the possibility to contribute to the quality of life is a happy individual. You have a purpose, you see? I think the worst of disasters is having a life without purpose. I think it is a horrible idea. AC: What was the most important moment of your life, as a religious leader and as a man? AK: I think that was when I became aware of my grandfather’s wishes when he passed away. This is because his decisions obviously changed my life. I was in university at the time. I was at Harvard. And I had to try to find a new academic orientation, because I had to finish my studies faster than I would have done in another situation. I was still an undergraduate but with a personal assistant and two secretaries, which was unheard of! There have been a number of unique things. But it worked out. And you know? I did not have my secretary take notes in college classes! AC: Do you regret anything in life? AK: No, I don’t think so … You know, it is not the way I think. AC: You are a very positive person. AK: I do not think in those terms. The answer is no. AC: Can you tell us what your day-to-day is like? We have already done a lot of work in the field of history because we want to make sure that we understand the evolution of the Ismaili thought, in the past…. And so we want to try to make sure that the philosophies of the past are well understood and can have adequate space in modern life. AK: It is essentially the life of the institution and what the institution requires, its manifestations and whether those manifestations are what they should be, or whether we should be doing things differently from what we do. We have already done a lot of work in the field of history because we want to make sure that we understand the evolution of the Ismaili thought, in the past. It is a religion of the brain, a religion of the mind. It is not just a religion of the soul. It is a faith of reason. And so we want to try to make sure that the philosophies of the past are well understood and can have adequate space in modern life. There is a whole context because it is a historical religion. We have an accumulation of history that is very important, and extremely pluralistic. It was formed from various parts of the world and from different languages. And today, all these communities are, in a certain sense, united in a single light, with different creeds, and these creeds are filling gaps in these countries where the gaps are not filled economically, at the educational level in terms of early childhood development, for example. AC: In terms of child development? AK: Yes, this is an area that has expanded enormously in the last decade, on a massive scale. What we know today about Early Childhood Development (ECD) is totally different from what we knew 20 years ago. That is why our priorities have also had to change. ECD, for example, is now one of our top priorities. And what we are seeking is to make sure every Ismaili child has the opportunity and access to ECD programmes. That will take time. It will take resources. However, it is a rational goal based on the good quality of science. A few decades ago we could be talking about the need for higher education, university, postgraduate and all those sorts of things. Today, we are completely focused on ECD. Because it has become the recognised basis for an educated society. You know, we learn from others. AC: Do you ever think about your heir? Over 40,000 members of the Jamat from over 45 countries around the world assembled at Feira Internacional de Lisboa for one of the largest Jamati gatherings in modern history and the final Darbar of the Diamond Jubilee year on 11 July 2018. Mawlana Hazar Imam was joined by Prince Amyn, Princess Zahra, Prince Rahim and Princess Salwa, Prince Hussain, Prince Aly Muhammad, Miss Sara Boyden, and Master Iliyan Boyden, for the historic occasion, which marked the culmination of the Diamond Jubilee Celebration held at Lisbon’s waterfront Parque das Nações. President of the Ismaili Council for Portugal, Rahim Firozali, delivered a loyalty address on behalf of all Jamats present and, along with Ismaili Council for Portugal Vice-President Azim Manji, presented Mawlana Hazar Imam with gifts on behalf of the Portugal jurisdiction Jamat. Presidents and vice-presidents of the jurisdiction Jamats which Mawlana Hazar Imam had not been able to visit during the Diamond Jubilee year, including Afghanistan, Australia and New Zealand, Bangladesh, the Far East, Iran, Syria, and Tajikistan, also presented gifts to Mawlana Hazar Imam on behalf of their respective Jamats. In preparation for Hazar Imam’s arrival to the Darbar hall, the Jamat in attendance viewed a film from the epochal ceremony held earlier in the day, in which Hazar Imam officially designated the premises located at Rua Marquês de Fronteira in Lisbon — the Henrique de Mendonça Palace — as the Seat of the Ismaili Imamat. The Jamat was surprised and delighted with a visit from His Excellency the President of the Portuguese Republic, Marcelo Rebelo de Sousa, to congratulate Mawlana Hazar Imam on the designation of the Seat of the Ismaili Imamat and the 61st anniversary of his accession to the Imamat. In the presence of President Marcelo, Mawlana Hazar Imam conveyed his appreciation to the government and people of Portugal for inviting him to establish this Seat in the country, and explained the significance of this unique moment in the history of the Imamat and Jamat. President Marcelo delivered a short address, congratulating Mawlana Hazar Imam on the occasion of his Diamond Jubilee, and the establishment of the Seat at the Henrique de Mendonça Palace. 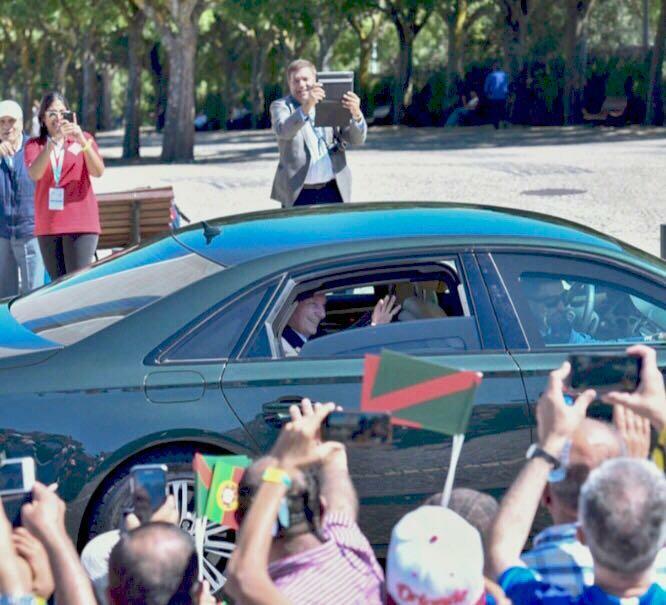 Following the Darbar, the Jamat celebrated with dinner and dancing at the Parques das Nações and a grand fireworks display across the Tagus River to bring to a close both the week’s celebrations, as well as the Diamond Jubilee year.